The Southern Illinois University School of Dental Medicine (SIU SDM) has expanded to meet the demands in the international dentist community through its International Advanced Placement Program (IAPP). The inaugural class of six students began the 27-month program on the Alton campus in February. The IAPP enables qualified dentists who have graduated from an acknowledged international dental school to pursue a doctor of dental medicine (DMD) degree at the SDM. Program graduates will be able to obtain licensure to practice dentistry in the U.S.
Students in the IAPP will first complete a three-month Clinical Certification Course. They will then merge with the SDM’s junior class to complete the final two years of the DMD curriculum. 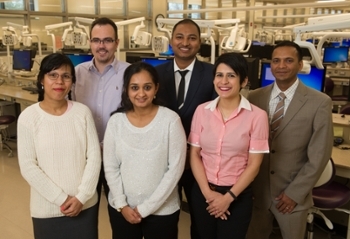 According to Ketteman, two-thirds of the inaugural class were previously dental specialists in their home countries. Dileep Varghese, a 38-year-old native of India, is a member of the IAPP class. Varghese has practiced dentistry in India, and worked as a dental assistant and dental hygienist in the U.S.
“I want to extend my sincere thanks to all who have worked hard to make this program become a reality and for giving us a chance to pursue our dream of practicing dentistry in this country,” Varghese said. “I have always known that the standard of dental education in this country is consistently high, and I take it as a challenge to rise up to the occasion and keep the professional standards high. “I am amazed at the lengths these individuals have gone to in order to be with us on campus,” Ketteman said. “They are dedicated, enthusiastic and willing to confront any hurdle in order to resume practicing the profession that they are all so passionate about. Photos: Six students comprise the inaugural class of the Southern Illinois University School of Dental Medicine International Advanced Placement Program (IAPP). 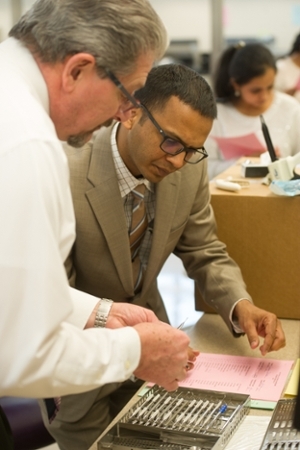 (L) Daniel Ketteman, DDS, director of the SIU SDM IAPP, reviews instrumentation with student (R) Dileep Varghese.